This painting is called "Mushrooms." Helps to know what those round things are. It is 16 x 20 inches done in watercolor on rag board. This isn't the traditional watercolor. When this was done I was doing other paintings in traditional egg tempera on board. 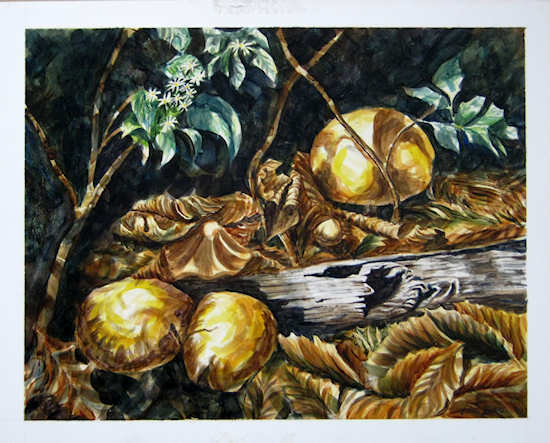 I read from egg tempera artist, Robert Vickery, how it was possible to use egg yoke mixed with the standard watercolor paints to get some of the feel of tempera. Well, I did learn it was possible to mix them but the result was NOTHING like traditional egg tempera. However, it was a good feel and look. It gives the watercolor a stronger and more painterly feel. It dries fast and has a sort of slick feel but gives it just enough texture to create a "different" sort of look. I ended up doing several paintings in this style.